It feels like I have been complaining about not having any cards for a few months. Work has been heating up recently, so that has kept my mind off of the dreaded cardboard deficiency. Over the past month, I have had a guy that sells me new card lots bring me cards, which I flipped pretty quickly. Aside from that, I have not been able to roll up my sleeves and dig in. 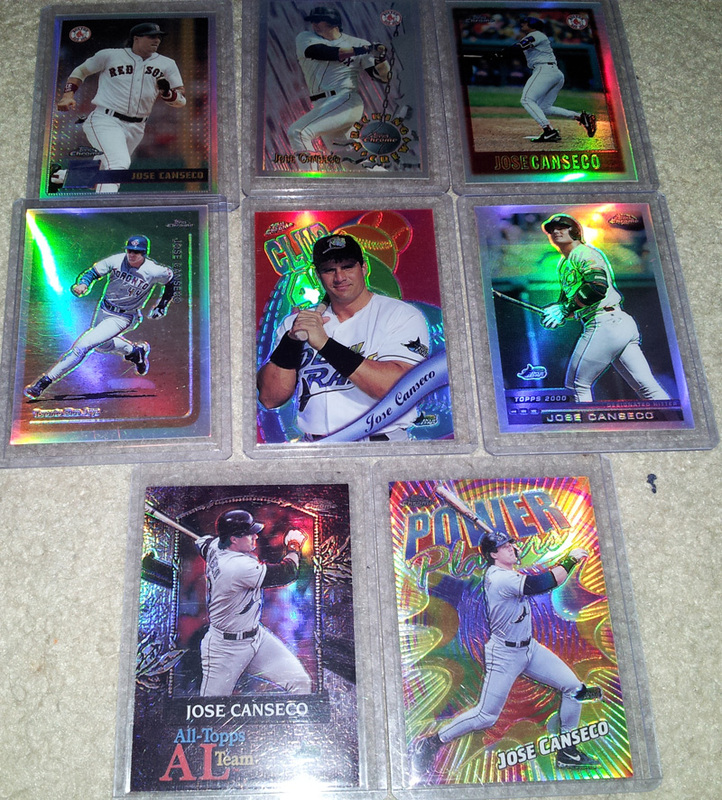 I have decided to just step back and enjoy collecting Canseco cards again. It has been a long, long time. 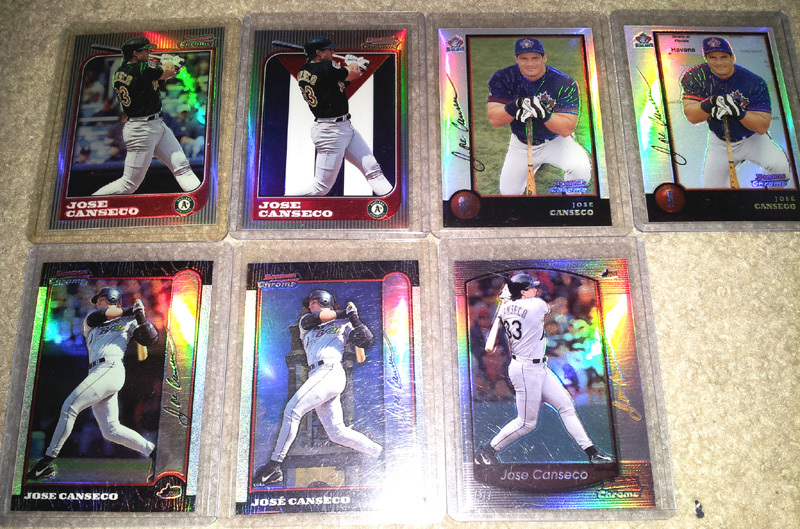 I have been so business minded for baseball cards, that I have not been actively seeking any Canseco cards forever. The majority of my old collection was just throw-ins from other collections, and stuff I would find from bulk lots. There was no rhyme or reason to it. I would imagine my highest dollar card was worth $10, and that was probably a good clip higher than any of the other better cards. As I started looking around and researching Canseco cards, I noticed something: A LOT of the cards out there – inserts, parallels, etc. never showed up in the millions of cards I have been through over the past several years. That is what I decided to focus on. From die cuts to gold signatures to refractors, etc. I simply didn’t have many of these at all! 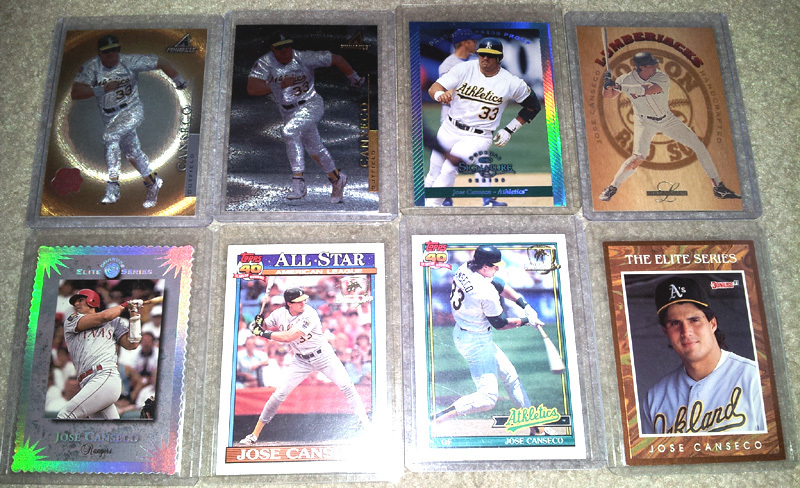 For example – I would have the 1991 Topps Canseco (who doesn’t?) but not the Tiffany or the Desert Shield. 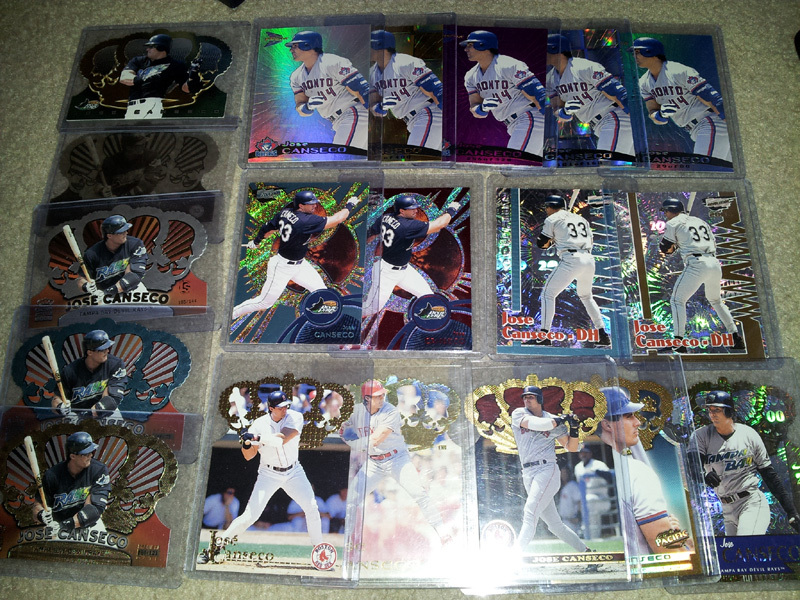 I would have the 90’s Donruss cards, but not the fractal matrix versions. I had 11or so game used cards, but not a single certified pack pulled auto. 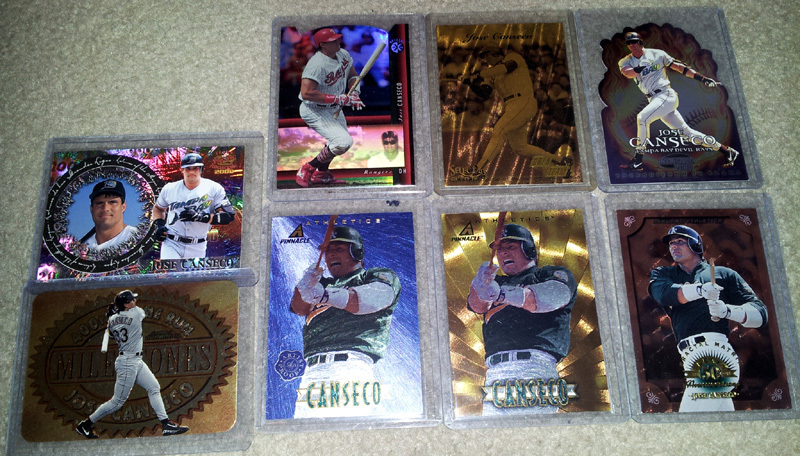 I guess there is something to be said about the Canseco collectors out there. When they find one of his cards, they don’t let go. If they don’t have it, they will pay dearly for it! I’m assuming his fan based is a lot like me. A male in his 30’s with some money that grew up living on every swing of his bat, hoping to hear the crack that sends the ball over the fence for yet another home run. I have been fortunate enough to grab about 300 or so of his cards from various places online. While the pictures below do not show all of them, they are my favorites. I have decided not to focus on the base cards, because those are so easy to come by, it takes no work at all! I always loved the 91 Elite. So impossible to pull. The 2 91’s are Desert Shield, the upper right is a wood card, the bottom left was the most expensive card in my previous collection. I love the looks of the others! I am just a flat out sucker for shiny parallels and die cuts, etc. These all look gorgeous to me. I am a fan of runs / rainbows / etc. 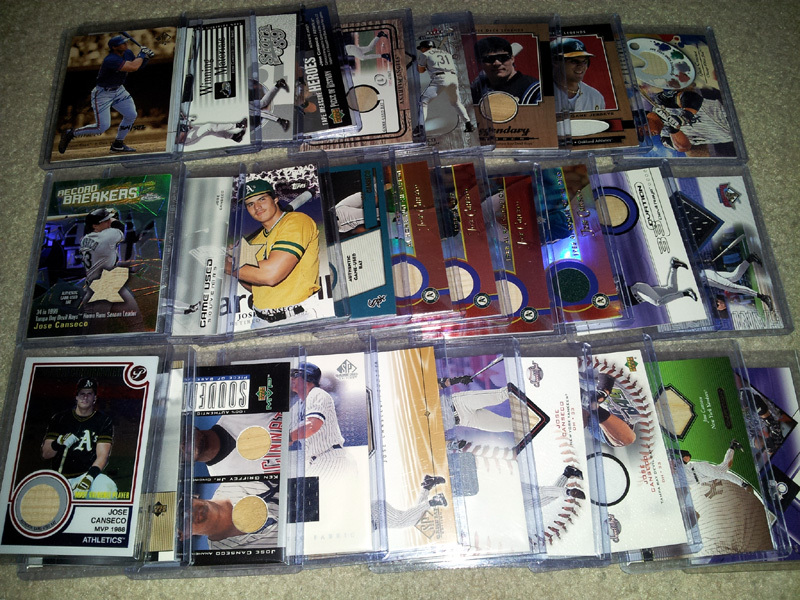 These are all die cuts, serial # or both! 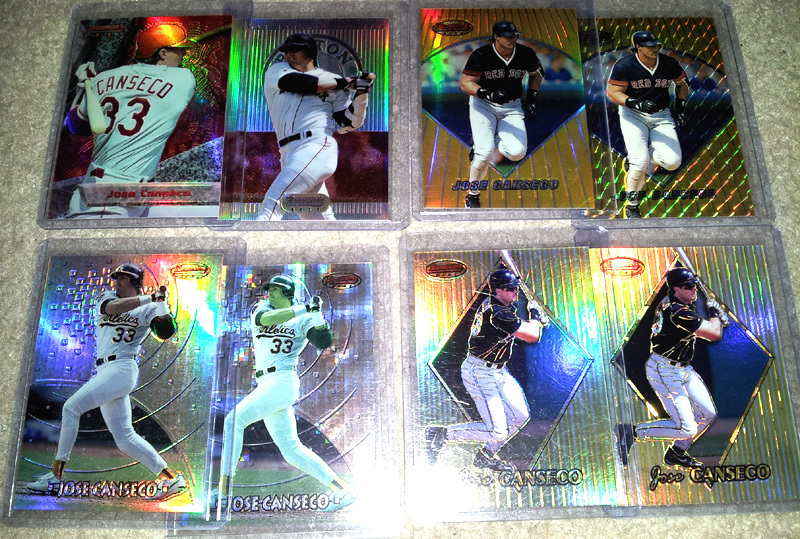 Beautiful run of Finest refractors – my favorites are the 93, 94 and 95 gold! 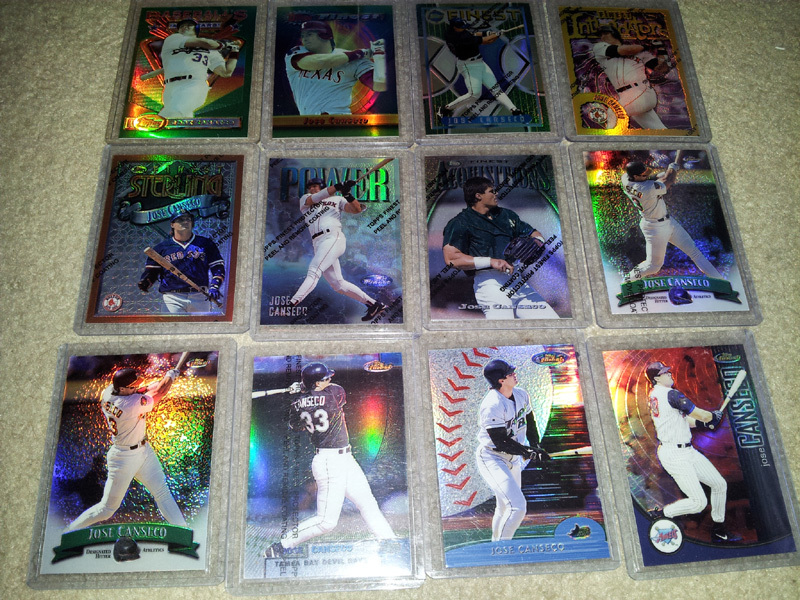 Gorgeous run of bowman’s best refractors and atomic refractors. I loev the ’94 most. His minor league cards from 1983, 1984, 1985 and maybe 1986. 3 of these cards I had from my old collection, which I kept. My favorites are the 1983 and the 1985 Burger King autograph. There are probably 200 or so more that are gold signatures, tiffany’s, press proofs, etc. 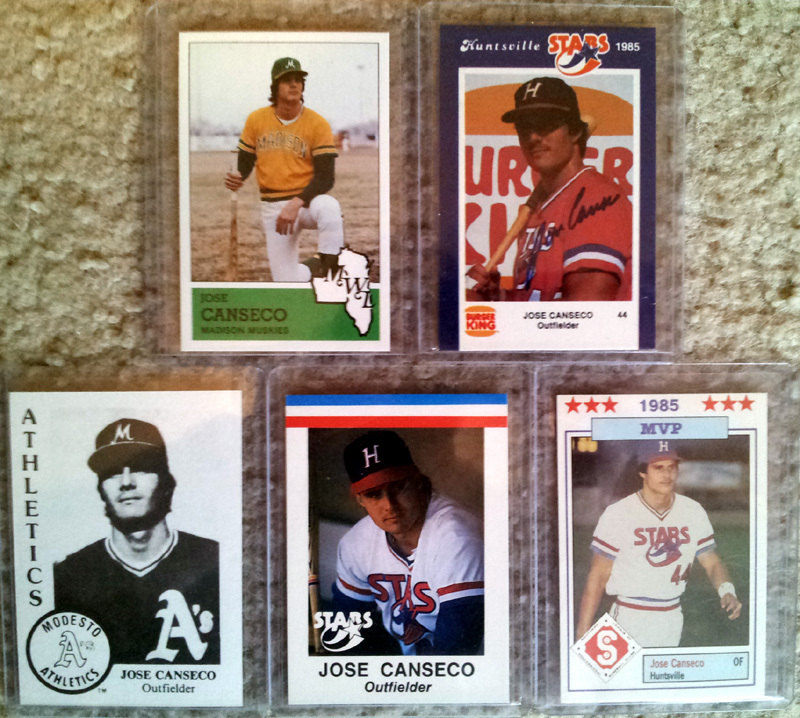 I am very much so looking forward to the card show at the end of January so I can pick up more Canseco goodness! An absolute incredible power house mega lot of super stars! They, by the way, are all for sale. Stay tuned, as I will be making another post about the unopened box bonanza that I went on over the weekend – I promise you – the purchase dwarfs this post! Won’t you join me while I have a heart attack re-living how much I spent!? It should be good fun.